Known for his fascination with Arabia, designer Shrekahnth, in his third year at DFW, presented a collection inspired wholly from Islamic art. 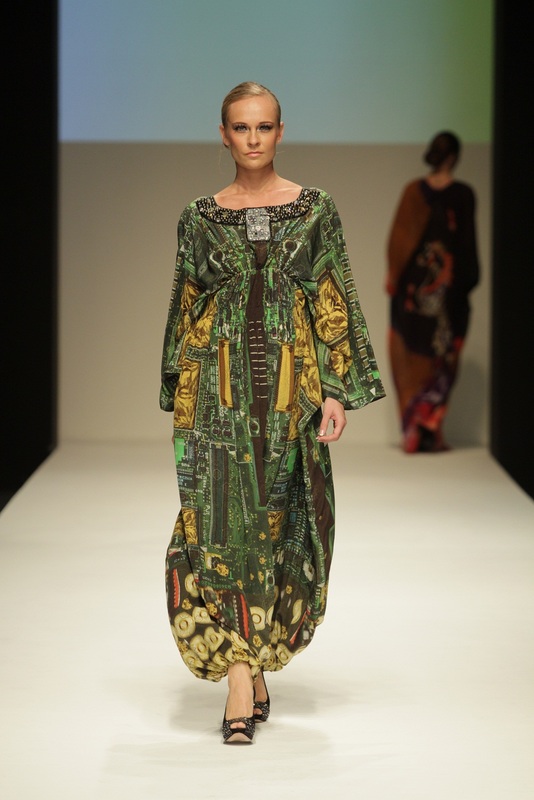 The “Arabian Nomad” collection experimented with digitally printed fabrics of pure silk, chiffon silk and satin silk. Robes in pale yellows, deep greens, pinks and blues flaunted flowing hemlines with square necklines. Busts carried motifs of flying eagles and digital fabric prints were enhanced so as to appear like wings on the back of the outfits. With decorated war horses and other Islamic art elements emblazoned on the outfits, the designer was inspired by fabrics and textures dating more than 600 years, which were used for historical Islamic embroidery and artwork. In trying to replicate nomadic textures with digital art, the designer also experimented with the famous Russian Matryoshka dolls on the outfits, bringing about a strategic blend of Arab heritage with Russian culture. The geometric patterns of the outfits replicated Islamic culture and art, while indulging in prints representing painted glass motifs as well as digital prints resembling cellular phone circuit boards. 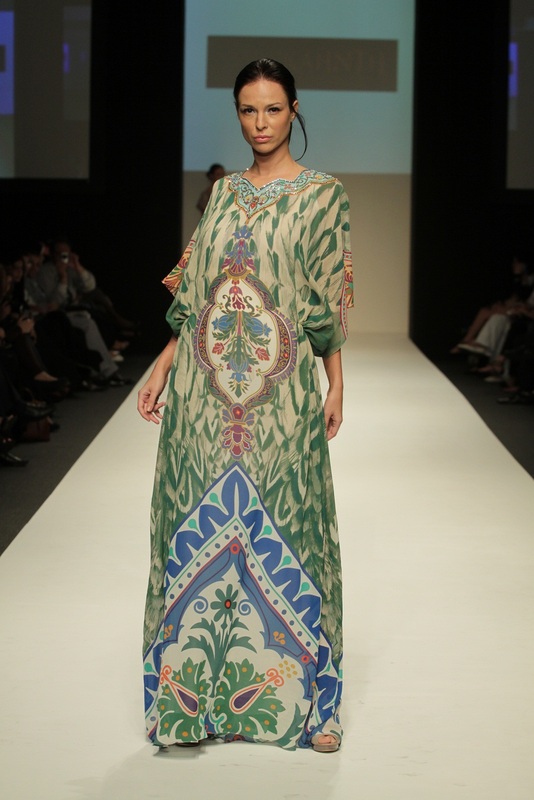 The “Arabian Nomads” collection was followed by Megha Grover’s Spring/Summer collection – a set of pure white outfits. Futuristic silhouettes merged with classic cuts as the collection displayed a variety of white ensembles ranging from short tube dresses to long gowns and pantsuits ending in jodhpurs. The crisp white collection of 15 outfits was embellished with crystals at the hemlines, sleeve ends as well as pant legs. A suit in white featured low cut pockets encrusted with the precious stones, as well as large necktie like pieces in full sparkle. With hints of Bohemian elements, the outfits of silk, satin and lace pointed to an elegant, yet laidback summer.